"Historic MP 1221.8. Port Alcan U.S. Customs and Border Protection Station . . .
instructed to do so by the border protection officer or until you have cleared customs. DO NOT TAKE PHOTOGRAPHS! Do not let pets out of vehicles." I cringed and reminded Jim of that warning when he 1) got out of the truck to 2) take pictures of the long line of vehicles building up behind us as we patiently crept forward toward customs. Although we were still about six vehicles back in the line at the time, he was clearly violating two of the Milepost's admonitions. Of course, I'd already been busy taking pictures of the line in front of us and the customs building well before this! We be bad -- not bent on mayhem, just tourists who are still pretty new at this crossing-the-border thing in an RV. indicates we're entering the Alaska Time Zone, which is four hours "behind" Eastern Time. lined up all the way down the hill to the welcome sign; Jim couldn't see the last one. The border patrol probably had surveillance cameras trained on us as we waited almost an hour this time. Only one border patrol agent handled the sudden crowd at lunchtime. 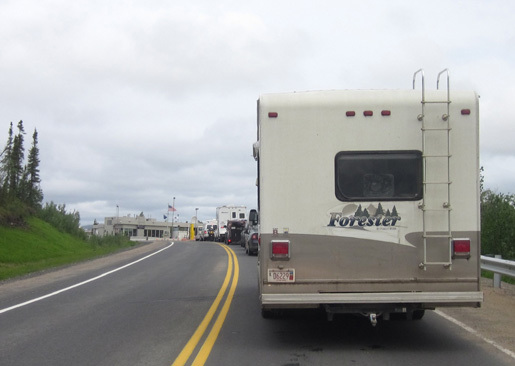 There were about ten RVs and passenger vehicles ahead of us when we arrived at the border. Within half an hour we couldn't even see the end of the long line of vehicles down the hill behind us. We're glad we got there when we did or the wait would have been much longer. 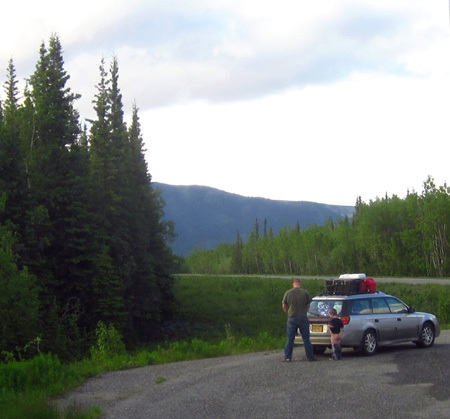 As we waited there were very few vehicles going the other way (into Canada from Alaska). 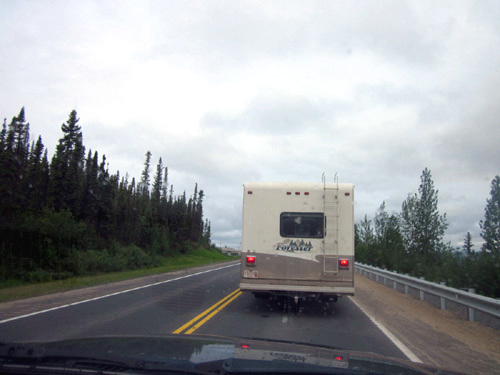 We crept forward every 4 to 5 minutes as each vehicle ahead of us moved. Jim had a bright idea after we saw how long each vehicle was taking to clear customs. He quickly went back to the camper to get bread, fresh egg salad, and a dinner knife. With that we made sandwiches in the truck. Eating lunch while we inched toward customs saved us time later and made us feel better. A hungry camper is not a happy camper. We caught up to the end of the line about 11:30 AM Pacific Time, waited for 51 minutes until it was our turn, and cleared customs in just two or three minutes. We figured the time "lost" was a wash because we "gained" an hour by entering Alaska Time at the border. Hooray! Not only are we now in Alaska, we're two-for-two for easy border crossings. Now we can see the border station. We couldn't see if any vehicles got pulled over for inspections. I was much less concerned about this one than when we crossed the border into Canada on June 2. We knew the drill and we were prepared with prompt answers and the necessary documents. 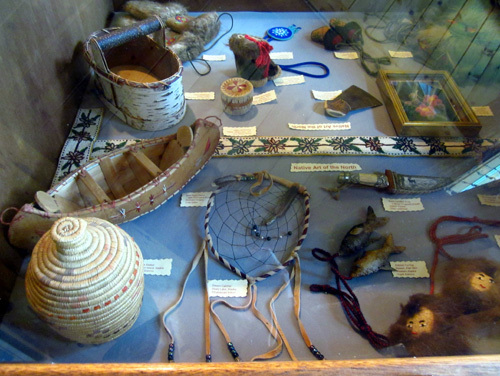 The customs agent asked fewer questions, but some different ones, than the Canadian one did. We expected all but one of the questions we were asked and our answers didn't raise any red flags -- passports, why entering Alaska and for how long, whether we had more than $5,000 cash with us (do people actually carry that much cash???? ), if we had any firearms, whether we had any pets and if Cody is vaccinated (didn't ask for proof). He didn't ask about proof of registration or insurance or whether we had any alcohol or prescription drugs. The only time we hesitated was answering what food we purchased in Canada. Jim turned to me for that one. Anyway, all that took a mere two or three minutes and we were on our way to Tok (pronounced Toke). There is a small visitor center and lovely sign welcoming folks to Alaska at the bottom of a long hill going up to the Alcan customs station. It's a good thing we didn't stop, however, or we would have been in line longer than we were. 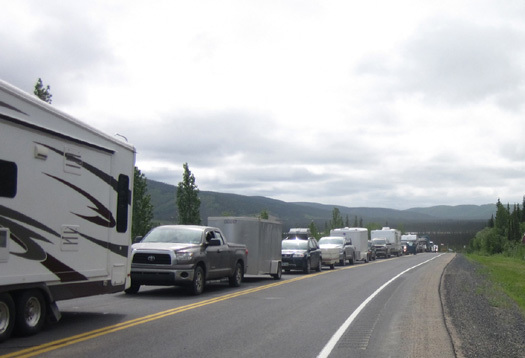 We saw so little traffic from Kluane Lake to the border that we were surprised so many vehicles got backed up so quickly at customs. Because each vehicle was detained at customs for several minutes it took a while for anyone to catch up with us as we headed west from there. 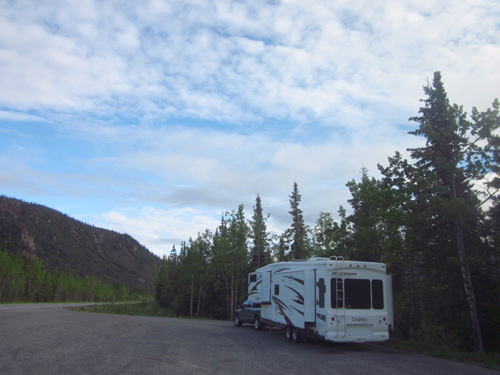 Yesterday we drove from the Congdon Creek Provincial Park campground at Kluane Lake, YT to a rest area on the Tok Cutoff several miles south of Tok. 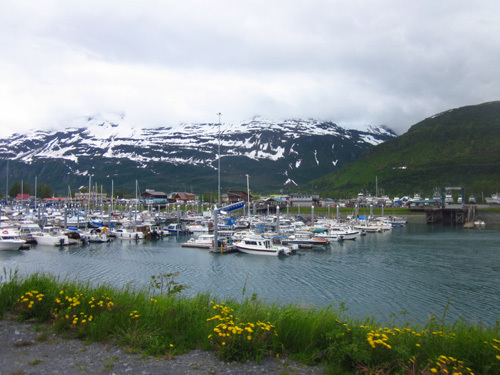 Today we continued to Valdez, a scenic little port city at the north end of Prince William Sound. From the border we continued driving northwest on the Alaska Hwy. Tok. 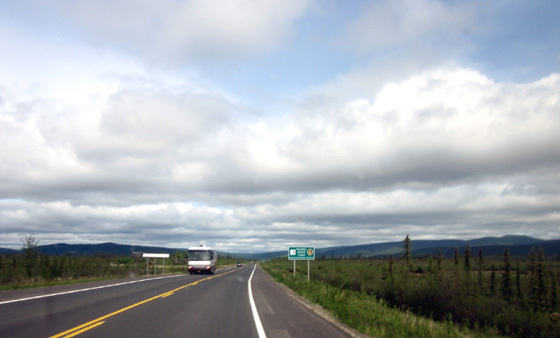 The Alaska Highway (AK 2) continues west and north from Tok to Delta Junction, where it officially ends. 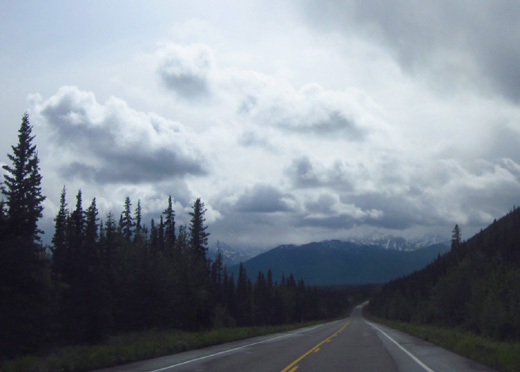 The total length of the highway from Dawson Creek, BC to Delta Junction is 1,387 miles. 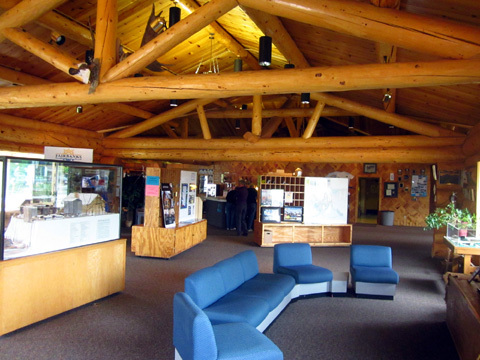 Many travelers continue from there another 95 miles on AK 2 to Fairbanks and go in a clockwise direction to visit the popular tourist destinations in the state. Since we're doing a counter-clockwise loop through Alaska this summer we headed south from Tok on the Tok Cutoff/Glenn Highway (AK 1) this afternoon. This is the main access route from the Alaska Highway west and south to Anchorage. 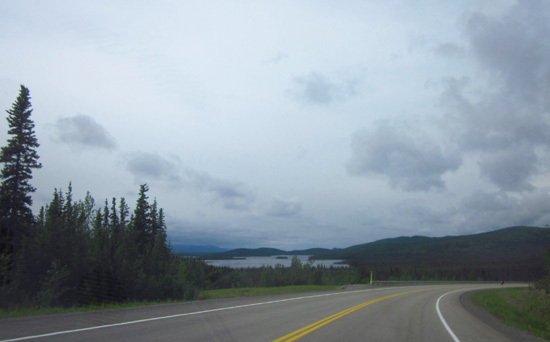 The Tok Cutoff/Glenn Hwy. goes south to Gakona Junction, where it coincides with the Richardson Hwy. (AK 4) for a few miles. At Glennallen the Glenn Hwy. goes west to Anchorage. We took the Richardson Hwy. south to Valdez, our first destination town in Alaska. 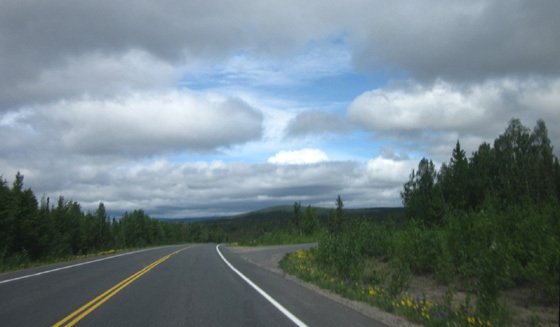 Most of the stretch of the Alaska Hwy. west from the Yukon-Alaska border to Tok passes through broad valleys on the north boundary of the Tetlin National Wildlife Refuge, with the Nutzotin, Mentasta, and Wrangell Mountain Ranges forming the backdrop to the south and other lower mountains to the north. We passed a lot of wetlands and lakes and followed the Tanana River for several miles. This is a major migratory route for birds. Sunshine and brand new pavement as we enter Alaska . . . how great is that?? 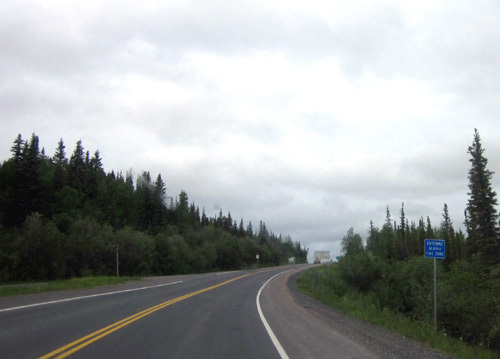 This section of the Alaska Highway is also designated as a Purple Heart Highway. Although we saw lots of warning signs for caribou, elk, bears, and moose we didn't see any of those critters between the Alaska border and Tok. We did see some nesting trumpeter swans in the lakes. As in the Yukon most everywhere it was very GREEN, indicating this area has gotten plenty of precipitation. Colorful wildflowers were abundant along the road. We passed through an area with volcanic ash and sand dunes that was completely out of character with the surrounding valleys and forests of spruce, lodgepole pine, birch, aspen, poplar, and willow. I noted at one point where we were at only 1,875 feet elevation that the new leaves on the deciduous trees were just coming out. In other places the leaves have been mature enough to look like summer. We're definitely going north! Tok is at 63+ degrees latitude, the farthest north we've been so far on this trip. We have passed through several burn areas along the Alaska Hwy. the past two weeks. One of the worst wildfires occurred near Tok in 1990. It shut down the Alaska Hwy. for a couple of days. A "miracle wind" diverted the 100,000-acre fire from the town at the last minute. Small deciduous trees and shrubs define the burn area east of town. Life goes on. TOK, THE "GATEWAY TO ALASKA"
This town of about 1,400 people is the first major town in Alaska that travelers reach from the eastern routes. It has several campgrounds and other services -- and we could finally use our Verizon phones and MiFi card again. I picked up all kinds of brochures about Alaska that will keep us busy reading for a while. One of the four state Public Lands Information Centers is located next door but we didn't go there. We also got diesel at the least expensive station we found in Tok. It was still a whopping $4.65/gallon but less than we'd been paying in the Yukon. 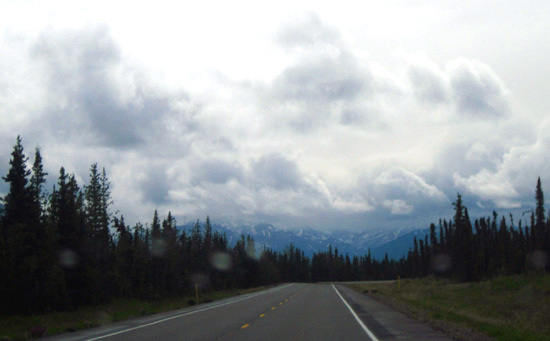 We continued south on the Tok Cutoff/Glenn Hwy, starting at MP 124. The mileposts are numbered from its intersection with the Richardson Highway at Gakona Junction, so for the first time since we began using our Milepost guidebook I had to read the information backwards. It's also confusing because the Glenn Hwy. has a different numbering system from Anchorage to Glennallen, where we continued south on the Richardson Hwy. Reading backwards was tricky at first and I missed some things as Jim drove. It was still raining off and on as we drove south from Tok. Next on our agenda yesterday afternoon was finding a place to spend the night. We'd seen so many parking areas along the road on the Alaska Hwy. that we assumed we could find a suitable one between Tok and Glennallen. Milepost lists every turnoff there is but we never know how big or how far off the road they are until we eyeball them. That means driving a little slower when we're trying to find a place to stop. We also knew there were several private and public campgrounds between Tok and Glennallen. 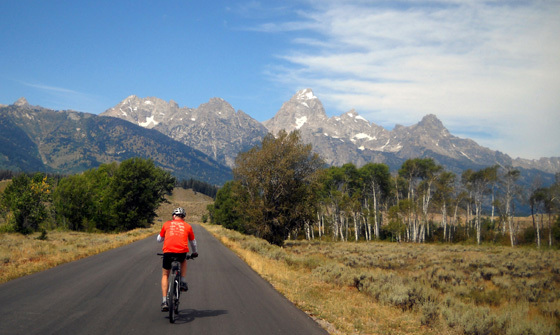 One we considered was the Eagle Trail State Recreation Site at MP 109. It's a nice campground and costs just $15/night. No one was there so we had our pick of 35 sites. Unfortunately they were all too small for our rig so we continued on. 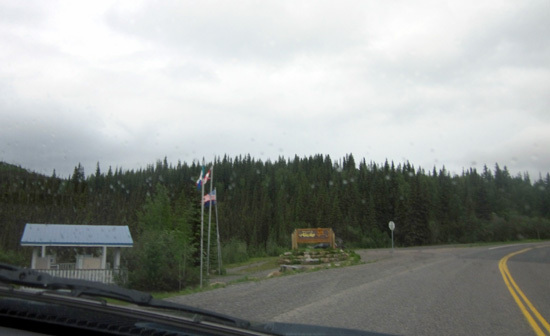 The Tok Cutoff is a straight shot south of Tok for the first 15 miles. Then it gets hilly as it winds through the Alaska Range. Although it was raining off and on and clouds obscured most of the peaks it was very scenic and green, with lots of wildflowers along the road. Traffic was still very light. We found a nice gravel parking area at MP 100 and spent the night there. No other RVs joined us. A moderate amount of traffic, most of it trucks, passed by as we spent the evening relaxing in the camper. The sun finally came back out in the evening and it was bright when we went to bed at 9 PM Alaska Time. Our bodies were still on Pacific Time, which was 10 PM. One SUV on its way north stopped briefly about 100 feet behind us. I watched as a father and his young son got out. Within full view of our back window the little boy dropped his pants and both proceeded to pee behind their vehicle! That little scene amused us. I was dismayed to see the amount of trash people left behind at this rest area. We're obviously back in the USA. We rarely saw that in Canada. A little grassy road went off into the forest next to the parking area but I didn't take Cody for a walk there. The "no hunting" signs drove home the message that bears probably inhabit the area.